Fall is here again at That Fish Place – That Pet Place. The leaves are changing color and, more importantly, the temperatures are dropping. Chompers is packing his bags for winter migration, and Bernie is digging out all of his old doggy sweaters. They already have their plans to stay warm this winter, do your reptiles? We mammals have it easy; when the outside gets too cold, our insides warm up. Reptiles, on the other hand work differently. 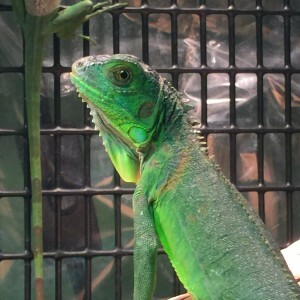 As you probably already know, our scaly friends need to be provided with warm and cool areas within their enclosures in order to allow them to regulate their body temperature as they would in their natural habitats. The most common way to accomplish this is by the use of heat bulbs, which are placed on a metal screened top of a glass aquarium. At first it can be overwhelming when trying to decide on what type of heat bulb to use. They come in different wattages. Some are round, others are beveled. Some are white, some are blue, some are purple, the list goes on. 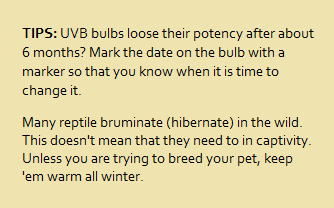 Luckily, with the help of our awesome TFP reptile staff, we get you started off with the right type of bulb to keep your animal happy and healthy. But just because they are indoors doesn’t mean that they aren’t affected by the changing temperatures outside. Every fall, customers come to us in concern because their pet, who has been happy and healthy all spring and summer, is now slow and lethargic. Sometimes they may refuse to eat. They may stay in their hide-out all the time. Or they may just not seem like themselves. Many people begin to fear the worst, forgetting that the fall drop in temperatures have a huge effect on their cold blooded buddies. If you are finding yourself in a situation like the one that I have just described, it’s time to re-evaluate how you’re heating your animal for the upcoming winter. Every species’ temperature requirements will be slightly different. For example, a rat snake only needs a basking temperature of about 85 degrees, where as a bearded dragon prefers to have one around 110 degrees. Most manufacturers post a chart on the back of the box to denote the approximate temperature output at various distances from the bulb itself. Note: These temperatures are approximations, usually based on 72-75 degree ambient room temperature. I personally use digital probe thermometers such as ZooMed Digital Terrarium Thermometer for all of my pets. Those little stick on thermometers might be okay for your beta fish, but not really for reptiles. The probe should be placed under the heat lamp, in the spot where your pet usually basks. 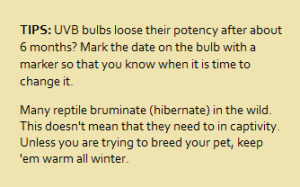 If your thermometer placement is correct and it is still reading too cool for the species that you are keeping, it’s time to get a higher wattage heat bulb or add a secondary heat source. 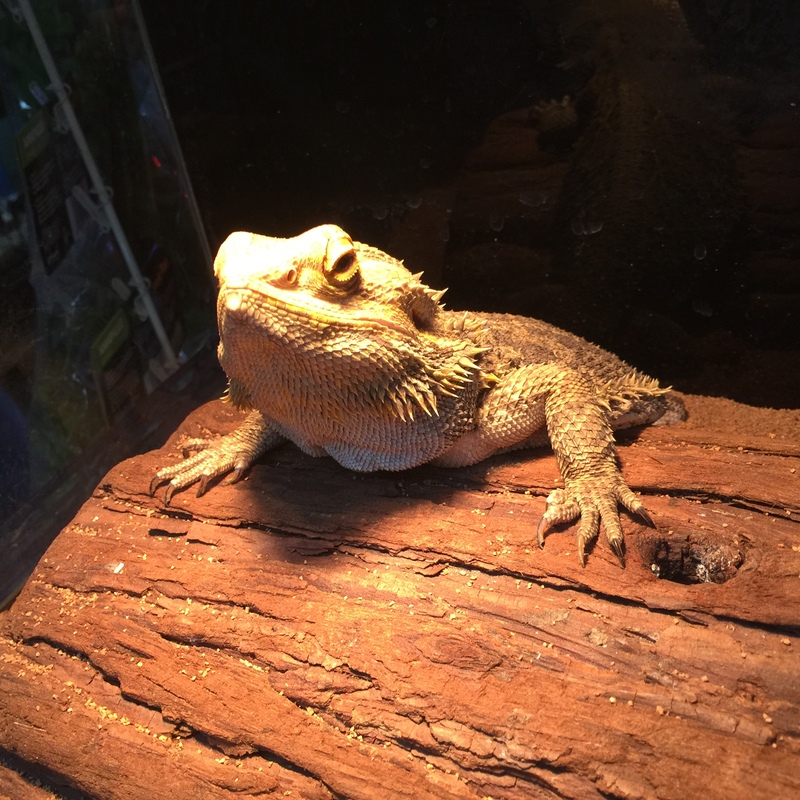 Our reptile room staff will be happy to help you quickly figure out the best way to heat your pet for the winter. We have heat bulbs of all shapes, colors, and wattages, as well as heat pads and even automatic thermostat systems which will let you “set it and forget it.” Stop on in! 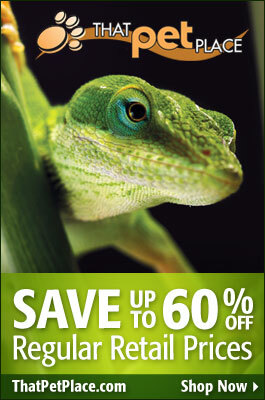 Your reptiles will thank you for it. We all love our reptiles, but most of us loathe their lunch. Many reptiles that we commonly keep as pets are insectivores, and the most commonly available feeder insect is the domestic cricket. 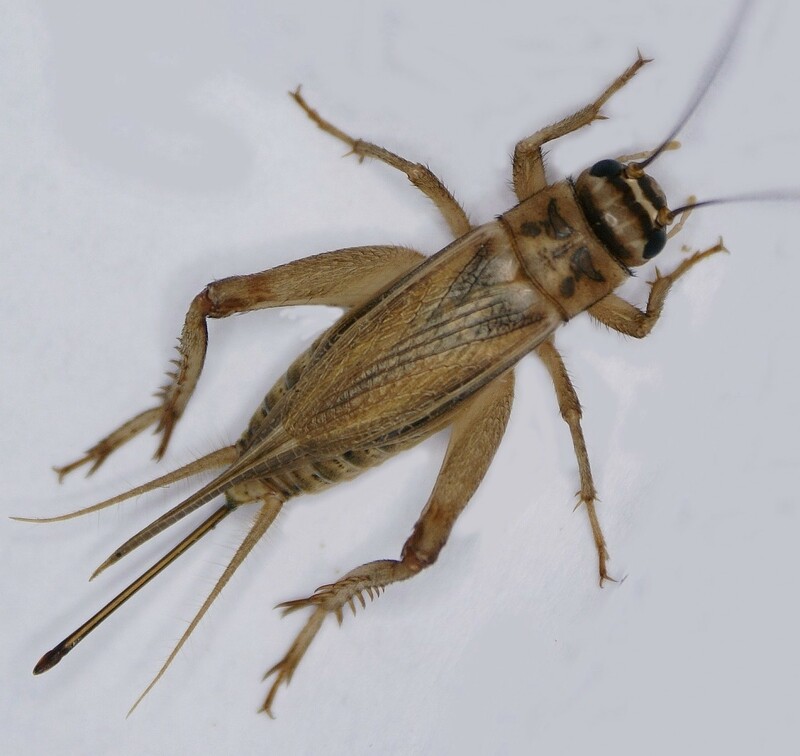 Yes, you read that correctly, “domestic.” Scientifically referred to as Acheta domesticus, the type of crickets sold as feeder insects have a higher protein value and a more docile nature in comparison to their wild counterparts. 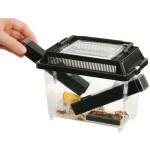 Although there are a few loopholes, due to laws that govern the importation of potentially invasive species, insects which are sold as feeders in pet stores throughout the United States and Canada must be domesticated versions of their wild counterparts. The process of domestication involves strict breeding guidelines which are used to bring out certain favorable characteristics within a species, and also ensure that they (hopefully) couldn’t cause too much harm if released into the wild. They need to eat: Crickets will eat almost anything. In the Reptile Room at our store we feed a special mixture of oatmeal, fish food, turtle food & dog food crumbs. 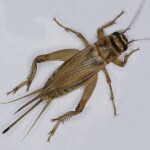 They need to drink: Crickets aren’t the smartest creatures, and if you put a dish of water in their enclosure they might drown. I prefer to use an all in one cricket food/drink combo such as Fluker’s Complete Cricket Diet. This provides both water and food for the cricket. You don’t have to have crickets jumping all over your house: Crickets are naturally tunnel/cave dwelling creatures, therefore they are attracted to darkness. You can use this to your advantage to keep them in their container, and off of your floors. Cricket Keepers such the Exo Tera Cricket Pen are a great thing to have. They have slots on their sides where dark plastic tubes are inserted. Being attracted to the darkness, the crickets hide inside of the easily removable tubes. All you have to do is slide out the tube, shake some crickets into your pet’s enclosure, then pop the tube back into the cricket pen. New Salamander Fungus Found: Are More Pet Trade Regulations on the Way? As a herpetologist and animal keeper, I’ve long been interested in the emerging amphibian disease commonly known as Chytrid or BD (Batrachochytrium dendrobatitis); please see my other articles, linked below. Believed to be responsible for the recent extinctions of over 200 frog species, this fungus remains a serious threat. In 2013, a related fungus, B. salamandrivorans, or BS, was identified. Since then, studies have revealed it to be as lethal as BD, and responsible for wiping-out the Netherlands wild Fire Salamanders. Once limited to Asian salamanders, some of which carry the fungus without becoming ill, BS seems to have found its way to Europe via the importation of Chinese Fire-Bellied Newts and other pet trade species. In order to stem the tide, the USA and the European Union are now considering import and sale regulations. Proposed regulations always raise hackles among pet-keepers and some politicians. However, amphibians sold in the pet trade (African Clawed Frogs), bait trade (Tiger Salamander larvae) and food trade (American and Asian Bullfrogs) have been implicated in the spread of the deadly Chytrid (BD) fungus, and released Burmese Pythons and various exotic fish are causing ecological havoc in Florida. So – what is the solution? Your thoughts would be most appreciated, please post below. As reported in Science Magazine (V. 346, No. 6209, Oct., 2014), researchers tested 5,000 salamanders from 4 continents for susceptibility to the newly-discovered fungus. Of the 35 species examined, some showed 100% mortality. 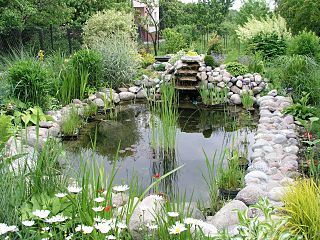 Included in this group were 2 well-known US natives, the Eastern Newt and the Rough-Skinned Newt. Several Asian salamanders were unaffected by BS, spurring fears that such individuals, while appearing to be healthy, could serve as long-term carriers capable of transmitting the fungus to other species. The millions of Chinese Fire-Bellied Newts imported into Europe from Asia are believed to be the primary route by which BS was spread to the Netherlands’ now extinct Fire Salamanders. The fungus may have found its way into natural habitats via discarded terrarium water and/or released pets. According to researchers at the Imperial College of London, there is no way to limit the spread of the fungi populations that are already established in Europe, and herpetologists predict that more local extinctions will be documented. The EU is considering restrictions on amphibian imports under various animal health laws. Fire-Bellied Newts and other Asian species are also popularly kept in the USA, home to the world’s greatest diversity of salamander species. With so many US natives already decimated by BD and habitat loss, and scores naturally limited to tiny ranges (i.e. the Texas Blind Cave Salamander), the arrival of BS would be disastrous. According to a recent New York Times op-ed piece (Oct. 31, 2014), Congress is considering increasing the US Fish & Wildlife Service’s authority to regulate the importation of pet trade animals. However, the process is being resisted by anti-regulation members. Working in conjunction with the US F&W Service, the Pet Industry Joint Council is seeking ways to limit the threat posed by imported Asian salamanders.